This will be the last post at Citizen Media Watch. As you might have noticed, we haven’t posted in ages. Our focus has been elsewhere, and continue to be so, so with some regret we are making it official that this blog is now simply an archive of our previous posts. We’ll keep it a “landmark only”. We have met a lot of interesting people and had great conversations along the way. We hope our old posts will shed some light on an era that came and went quite quickly, but changed journalism in many ways. Over the years we’ve addressed countless issues, for instance we wrote about Wikileaks before it got public. Here are some of our other favorites. • Citizen media: A definition. The very first blog post. • Thinkpublic – designing with people. The last post, with many thanks to Brit Stakston for the video interview with Ella Britton at Think Public. Gitta: I think that think public, both on land and online, will grow as a phenomenon and become a way to create a more open and smarter communication. We had an ambition to cover not only citizen media in the western world, but to some extent have a global perspective. We’ve written about projects and events in China, Sri Lanka, Belarus, India, Korea, Thailand, Brazil, Iraq, Singapore, Tunisia and Lebanon. Lotta: Citizen journalism’s strength is most shown in countries where freedom of speech is limited. The Tunisia prison map is one great example, there are many others. With internet access ordinary people can report first hand on troubling events. The newsroom of Folha onLine, São Paulo, Brazil. • Brazil’s no. 1 online newspaper Fohla OnLine – and its bloggers. Gitta’s first guest post at CMW, before she became a regular blogger here. It got numerous hits from Brazilian readers: a visit at the editorial desk at Folha OnLine, in São Paulo, Brasil. Lotta: It was a natural development of this blog for me to invite Gitta to be a 50/50 collaborator after her having contributed three great guest posts. We make a good team! Gitta: It has been totally awesome all the way working with Lotta and CMW. We are both storytellers, work-o-holics and Internet addicts. Over the years we spent writing at CMW, hyperlocal news went from the next hot thing to failing because hyperlocal markets weren’t ready, to now again being quite interesting since geotagging and geolocation through smartphones is really taking off. • Here’s one of many posts on this topic: Geotagging makes YouTube videos local at iCommunity.TV. Lotta: Just look at Gowalla, FourSquare and now also Facebook’s recent integration with Places. We tell stories based on where we are, to a select number of people or to the world. Collaborative maps pinpointing events certainly have their place on major news sites too. Gitta: It has taken far more time to get there than I thought i would. I seriously thought that geotagging would be implemented and a part of our navigation tools, much earlier. But, let’s handle it wisely and with care. We got opportunities to lecture from our experiences at CMW. 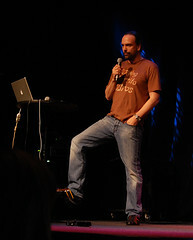 For instance Gitta was invited by Jonas Söderström (Inuse), to teach web journalism at Fojo. Gitta: I managed a one week web journalism seminar at Fojo, with a group of independent Belarus journalists and held some lectures for Belarus journalist students, from the Istitute of Journalism, Zjurfak, at the Belarus State University, BGU. Being the teacher I learned a lot about their situation. Freedom of expression is not to be taken for granted. Thanks to Fredrik Wackå, Lotta got invited to the university in Karlstad to speak about the role of journalists in future media. Lotta: I was asked who else they should invite, and thus got the opportunity to suggest Robin Hamman of (then) the BBC and to meet him and discuss the Manchester blogging project I had been following since 2006. • Will there be a dark period for journalism? 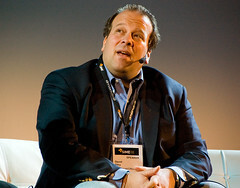 Some thoughts after listening to the journalism debate at SIME 2008. Also published in Swedish at Mindpark. Joakim Jardenberg is a keen Creative Commons advocate, and he also blogged about our SIME interview with Joi Ito. Gitta: I has been an honour to collaborate with Joakim Jardenberg as a member of the Mindpark blogging team. Both Lotta and I admire his will to unrelentingly guard the soul of the web. We had a talk with Joi Ito about hyperlocal citizen media and Creative Commons, among other things. • Joi Ito: Don’t sign bad licenses. Our meeting with Joi Ito, and a discussion about hyperlocal citizen media. Gitta: Our meeting with Joi Ito was one the memorable experiences from my time with CMW. Creative Commons is one of the most interesting movement on the Internet. The shift from megaphone to discussion partner was a major one, and is probably the one topic we’ve covered the most. Here are some of our posts on the matter. • Personal transparency, the eleventh change for journalism and Personal journalism, the future of online reporting. Some thoughts on the role of future journalists. • Sandra Jakob at HD.se – It’s not laziness, it is fear. One of many geek girls with great ideas in a series of video interviews. • The Lebanese ambulance attack and trust in citizen – and established – media. On trustable sources, bias, traditional media and the blogosphere. • Swedish news sites narrowing the gap to the blogosphere and The Twingly effect. When Swedish news sites first connected to the blogosphere. Lotta: I was working at Aftonbladet in February 2006 when they started Läsarbladet, The Readers’ Daily, and I became Readers’ Editor. It was an attempt to engage the readers to contribute with journalistic material to the site, and to create an alternative starting point with the most read and liked stuff in focus, as opposed to the editors’ choices. It soon became obvious that as an online tabloid it was easy to get readers to send us great photos of their cats and creative gingerbread houses, but enormously difficult to get initiated articles from readers on today’s topics. Later Newsmill proved it could be done, though in the form of opinion material, and also showed the need for asking the right questions. Gitta and Lotta with Ruiwen Chua and Sriram Krishnan from NUS. • Hej! 2007 live updates. Live blogging from Hej! 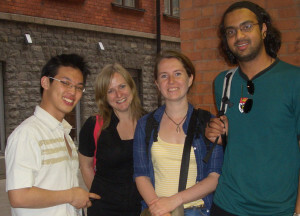 2007 and meeting all the great people there, who soon conversed on microblogging service Jaiku. • Why Jaiku outshines Twitter. Fond memories from the Jaiku era. Gitta: I worked and lived in Singapore, year 2000–2001, starting up the Icon Medialab office. When the NUS guys invited us, parts of what later should be named as ”Bubblan” on Jaiku, to their KTH projects, I felt like home. I would like to send all my love to: Sriram, Ruiwen, Ramkumar and Mahesh. Lotta: Hej!2007 and the following Stockholm NUS events showed us Swedes what unconferencing was all about, and led the way to great (un)conferences like SSWC and Annika Lidne’s Disruptive Media conference series with integrated Twitter feeds on display. I really enjoyed going to Singapore with Gitta and meeting up with the NUS guys again in 2008. Blogging is of course a great tool for citizen media, and it’s gone from a marginal activity to becoming mainstream. • How many Swedish blogs are there? 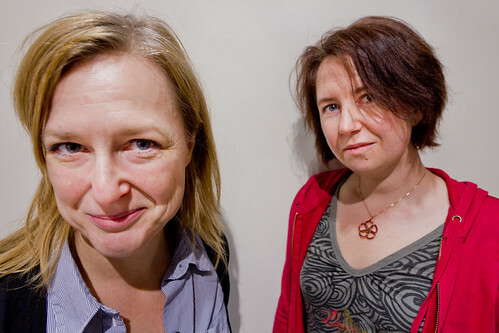 An attempt to sum up the Swedish blogosphere in 2007 which got some attention. We were invited on a bloggers pass at Sime 2008, thank you Andie och Mahesh. Since we are two proud GeekGirls we took the opportunity to talk to YouTube phenomenon Mia Rose about her music and techie geekiness. The interview put on Youtube has reached over 17 000 fans, so far. • Mia Rose: Portray yourself with your true colours. An interview that attracted a large and quite different readership than we were used to. Where’s the money? A lot of citizen journalism projects met an early end due to lack of resources. Backfence is one of many examples. • Backfence’s Mark Potts: We’re re-evaluating our strategy. Email interview with the Backfence co-founder after I posted Trouble at Backfence? Being successful using the web to collaborate and ask for material for making hardcover books sounds kind of awkward in the era of the ebook, but it works really well for Fredrik and Teo Hären. There are lots of more examples and yes we should have written all about them. Gitta: I would liked to been able to write more about business opportunities made wisely, on the web and via communication social media. Lotta: Starting out we were examining a fairly new territory. My focus was on understanding it and its future implications. I think now that perhaps we should have moved on sooner to looking at the revenue aspect, even though we did address it some. I guess the main reason I didn’t focus much on it is that it’s not what makes me tick. I’m a sucker for creative ideas not too limited by the harsh reality of economics. From now om Citizen Media Watch is a landmark only, but this is not a goodbye, this is a HELLO! Gitta: Digitalstorytelling.se (in Swedish only). The focus is on local political decision making, and Bunz draws a parallell to the public subsidy NPR has received in the States, pondering if this might be a model for the UK too. Another option is funding from organizations like the Knight Foundation. In Sweden we’ve seen several local newspapers/sites collaborating with bloggers for local and hyperlocal news (one recent example is Smålandsposten’s Mitt Lammhult), but the national papers seem less prone to. The largest daily Aftonbladet still has its locally contracted bloggers on the larger cities’ pages on Bloggportalen – for instance Norrköpingsbloggen on the Norrköping page – but with the loss of the local sections on Aftonbladet.se I doubt they get much public or journalistic attention. A lot of them are no longer active. At the same time there are cities and even whole regions who lack journalists covering them, reports Swedish journalists’ union’s paper Journalisten (unfortunately I can’t find the article available online). It’s not a problem in itself if national media skip local coverage as long as there are local initiatives – by journalistic sites of bloggers with an interest in these issues. Where they’re lacking, though, there’s a danger that corruption spreads. Disclaimer: I am a former employee of Aftonbladet.se. Microblogging/microstreaming service Pownce announced yesterday that they are closing down the service and becoming part of Six Apart. We have some very big news today at Pownce. We will be closing the service and Mike and I, along with the Pownce technology, have joined Six Apart, the company behind such great blogging software as Movable Type, TypePad and Vox. We’re bittersweet about shutting down the service but we believe we’ll come back with something much better in 2009. We love the Pownce community and we will miss you all. We’re very happy that Six Apart wants to invest in growing the vision that we the founders of Pownce believe so strongly in and we’re very excited to take our vision to all of Six Apart’s products. Mike and I have joined Six Apart as part of their engineering team and we’re looking forward to being a part of the talented group that has created amazing tools for blogging and publishing. So it looks like some microblogging functionality will be integrated into these blogging services. I for one think it’s only natural that we see some microblogging services closing down. There will probably be a concentration to Twitter, Jaiku and a couple others that turn out to be the better ones, or simply where people you know are. Though it’s a piece of cake to automatically update several microblogging sites, there’s little point as long as there are no smart ways to keep track of replies and be a part of the conversation without having to check all the sites manually. If you know of a good service that does that, please let me know. Other news from Six Apart: they are giving away free pro accounts to laid-off journalists (via CyberJournalist) in the TypePad For Journalists Program. We want to help independent journalists become more entrepreneurial, and to give you the tools you need to succeed with your own blog. Cool initiative. For those who are not accepted, there’s always WordPress, of course. Good use of microblogging in journalism – give us more examples! Whether status updates on social media sites should count as microblogging or not, the walled garden that Facebook still is to a large extent, makes status updates if not useless from a publishing perspective then atleast difficult to accommodate as they are on an open to all site. The same goes for users whose updates are not public on regular microblogging services. For crowdsourcing, feedback and research they are still good tools. There are good examples of microblogging serving a journalistic purpose, though these initiative do not necessarily come from professional journalists. The Twitter Vote Report is one, where Americans across the country made short reports on how the voting in the US election was really going, using hashtags to pinpoint where they were and what their report was about, for instance #machine for problems with the voting machines. They also reported on waiting times. It all ended up on a big map where you could follow the progress in real time. Get eye-witness reports and comments. For instance check out this Twitter channel on the bombings in Mumbai. More on the Mumbai coverage here. Live reporting from an event. By using an established microblogging site you get comments from site members and you invite them in a natural way. Live commentary to tv shows. One example is Drive on Fox. Coming up with questions for interviews. By asking people what they want to know from a person you’re to interview you get more interesting questions, and you know you’re asking stuff your audience want to know. Local news gathering. Here’s an interesting example from Harrisonburg, VA. Or even as a source for bigger breaking news. Cynthia McCune talks about microblogging as a ”21st century police scanner”, listing these uses for reporters: keep up with sources, get quick feedback, get referrals, post live updates to sport scores. Breaking news. Anders Brenna at digi.no writes: ”Twitter is both the perfect journalist tool for being first with breaking news, and the best relief from the tyranny of breaking news.” Super-fast publishing of the latest news without risking that the reader won’t come to your site for the full story. You can even send a message and point to it once it’s out. Paul Bradshaw has some advice for anyone wanting to use microblogging to cover a topic. Check out the comments too for a few ideas on good use. Another post on how news makers have to change and use micro-blogging tools. Do you have more good examples? We’ll collect them and update this list (giving you credit, of course). Also, here’s some advice on what not to do. Will there be a dark period for journalism? Will we see the collapse of journalism as papers fail to take the step over from dead wood publishing? Or are we at a dawn of a smarter news industry? Opinions vary, and we take a look at what some are saying right now. 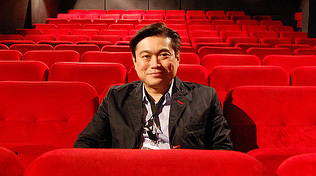 At SIME, Joi Ito expressed concerns that professional journalism journalism may perish. – I think that everywhere where we’re losing the revenues of physical distribution or transaction costs, whether that’s the financial markets affording analysts or whether it’s academic journalism affording peer review, all these professionals that used to be hired to deal with quality are being put out of business because the distribution can’t afford to pay those guys anymore, they’re all suffering from the same thing. I think bloggers and all the amateurs will pick up a bunch of that, but there’s still going to be this gap. I think it’s going to be a while before we get organized enough. And I’m afraid that professional journalism may collapse before we pick up, and there may be a kind of a ”dark period” when we can’t send people to Sudan or we don’t have the ability to fight against the biggotous people that we ought to be going after. David Sifry thinks the future of journalism lies within the blogosphere. – I think we actually have a responsibility, given the fact that we are all disintermediating these big media companies, to make sure that we can find a way to help make sure that journalism survives. 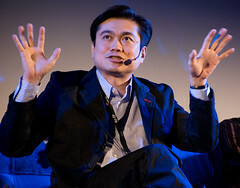 Joi Ito and David Sifry in a panel debate about blogging and journalism during SIME 2008. Yesterday, Joakim Jardenberg of Mindpark wrote a long blog post describing the steps necessary for a paper distribution-dependent local newspaper to make enough money online to be able to survive without the paper edition, should that be necessary. It’s in Swedish, so I’ll take you through his main points. His solution has three parts: having enough visitors, knowing/keeping track of visitors and using advanced mechanisms to match them with advertisers. Like Jardenberg says, this is no rocket science and behavioural targeting is nothing new. But it hasn’t been evolved enough, and that’s why Jardenberg’s take is interesting. He gives an example with real figures from local paper Helsingborgs Dagblad, and he’s pretty convincing. They need a 40 percent share of the money spent on local advertising in their area to make it. Technology isn’t quite mature enough. But with baby steps in the right directions we’ll make it in time. Local sites might lose their relevance. Without an audience the revenue model collapses. We might not have the stamina. This won’t pay off tomorrow. Count on 5-10 years to reach those 40% in a healthy way. Our sales force is immature, we still sell paper ads online. Our main advantage, our local sales people, are also those who need to change the most. 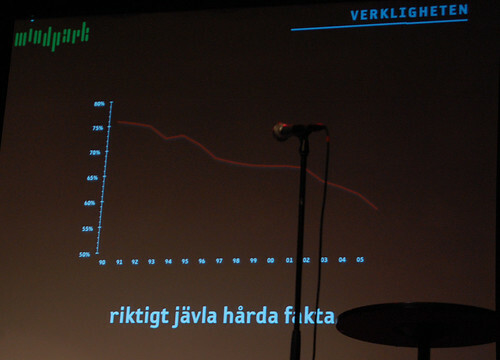 A slide in a presentation by Joakim Jardenberg about the decline in Helsingborg Dagblad’s reach. Jardenberg goes into more detail, and has interesting ideas about data collection and transparency, so if you’re interested, here’s a rough translation of the text through Google Translate. On the whole, he is optimistic about the future of journalism. The death of local relevance, as mentioned by Jardenberg above, is one of two threats addressed by Jonathan Kay in a blog post at Canada’s National Post’s Comment section’s blog, Full Comment. Kay talks about saving the print media, but this could well be applied to local journalism on the whole. The breakdown of Canadians’ sense of community has also contributed to newspapers’ challenges. Slogging through stories about the people who share your city, your province or your country makes sense only if you feel a sense of emotional investment in your neighbours. But in a globalized age, an increasing share of Canadians don’t feel that way. As office-bound yuppies, they commune with their distant college-era friends using Facebook or email, but don’t know the names of the people they pass on their street. (1) Business-oriented media that cater to older, more affluent readers of the type who can justify the expense of long-form news consumption (in both time and money) as a work activity. As Kay is talking about the survival of print, I am a bit surprised about his third point. I think hyperlocal is one of the areas where the web can bring so much more than a print product, as it’s all about communication and round the clock updates. But then, hyperlocal sites are struggling. When Gitta and I talked to Joi Ito a few days ago, he said hyperlocal is failing because local businesses aren’t mature enough online. I think that’s a valid point, and I believe that once they mature and more and more people expect to find hyperlocal news online, this is a very interesting area. My own take is that journalism will survive and come out stronger and better through this media shift, though it will take a few years of struggle. And it may not look exactly like it does today at the end of it. Which is probably a good thing. Update: There’s a Swedish version of this text availble at Mindpark where we were invited to guest blog. This week it’s the yearly SIME (Scandinavian Interactive Media Event) conference here in Stockholm. Previous years I’ve found it remarkable that a conference about ”digital opportunities, technology, communication and entrepreneurship” haven’t given much thought to the audience’s want to communicate and use these ”digital opportunities” during the conference itself (no or badly working wifi, no backchannels, no bloggers invited etc). This year there seems to be a change of attitude. Citizen Media Watch is one of 14 invited bloggers who have been given Blogger Press Passes to the event. Many thanks! This means that we’ll be covering SIME for two days – Wednesday and Thursday this week. We’ll be bambusing, taking photos, possibly live blogging, definitely microblogging, and also making a few video interviews that will appear on our blip.tv channel a bit later on. Today Gitta and I met to plan our SIME coverage. Here’s what some of it looked like. Over at Same Same But Different there’s an interesting guest post by politician Camilla Lindberg, the only member of one of the government parties in Sweden who voted against the new and controversial wiretapping law, commonly known as the FRA law. The debate about the law was a real breakthrough for the Swedish blogosphere (which to a large extent celebrated Lindberg as a hero for voting against her own party), but in her guest post Camilla Lindberg says this does not mean that bloggers can always rely on being taken more seriously from now on. The blogosphere won the FRA debate because it was right. It was an issue that was pretty much dead everywhere else. It touched a nerve, it made people react. And – although not each individual blogger could get all the technical facts of a very complex issue right – it was possible to discuss it on a fundamental level. Lindberg expresses criticism against the mass-emailing staged by evening paper Expressen, which urged people to copy a text about the FRA law and send it to all the members of the Swedish Riksdag. She thinks this is a form of spam rather than a good way to communicate people’s opinions to decision makers. There blogs are a better option, and Lindberg stresses their role as opinion media. Blogs are first and foremost opinion based media. When competing with tv or papers that have greater resources for investigative journalism, fact checking and the like, they are underdogs, even if they can compensate for this somewhat through networking. But misconceptions and errors can still spread through blogging networks. In such cases you lose credibility. The lesson to learn is that the impact of a medium depends on trust. Trust is volatile. You have to nurture it, or you will lose your readers. On too many blogs written by Swedish journalists you see people commenting but the journalist never replies. They use a platform built on conversation as yet another megaphone, ignoring their readers. What journalists turned bloggers need to understand is that providing a space for comments is not enough – if you want to be taken seriously as a blogger you need to get involved with your former audience, not just invite them to chat amongst themselves. Over the past week, Paul Bradshaw over at Online Journalism Blog has been publishing a series of posts based on a survey he’s conducted with 200 blogging journalists from 30 countries, mentioned ealier here at Citizen Media Watch. The aim of the study was to find out how the journalists perceive that their work has changed after they became bloggers. The areas of interest are idea generation, information gathering and production, with the addition of the relationship with the (former) audience and post-publication. Today the final post was published along with the conclusions from the survey. I do recommend reading all the posts about it. The results shows variations in responses depending on what field the journalists cover and in what medium. The part I found the most interesting was the bit about the conversation. I’ve long been talking about the changed role of the journalist, and being interested in what your commenters have to say, and responding to it, is key. 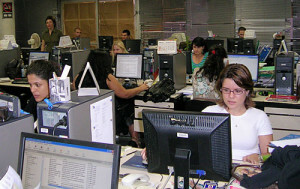 The ability to enter into correspondence with users, to fix errors and post updates were frequently identified as changing journalistic work, turning on its head Lowrey’s sugestion that bloggers “often emphasise immediacy and opinion at the expense of accuracy” (2006) and that journalism would protect itself by focusing on editing; responses suggest that, conversely, journalists are relying on commenters to contribute to the editing process. Without an interest in the audience, blogging is not a conversation. Without conversation, you’re missing some of the great opportunities that blogging brings. Are you a journalist who blog? Check out the Online Journalism Blog’s new survey and help Paul Bradshaw get info for a book chapter he’s writing on the subject of journalists blogging. I’d like to add an eleventh change/challenge for journalists. One that is closely connected to no. 1, but I think it deserves it’s own mention. As a consequence of blogs, wikis and citizen media sites becoming more important sources of information for the general public, I think we’ll see a new awareness of the importance of trust, and knowing who your source of information is. Bloggers are often open about what their views are and who they are affiliated with. If they’re not, you bet someone else will find out and make it public. I am convinced this openness will be demanded of journalists as well. You might not need to reveal details about your private life, but you will need to give your readers/viewers/listeners an idea och what you represent. This is an important distinction, since for instance journalists working with sensitive information, infiltrating or walraffing will need to remain fairly anonymous when it comes to for instance how they look and sometimes even what their names are in order to do their job well. But they can still build up trust. Swedish blogger Beta Alfa is a good example that you do not need to reveal your real name in order to achieve this. Being open about your affiliations, for instance, and anything else that might influence or be suspected to influence your work, is a good start. Also simple things like providing a list of links to what you’ve written before on a subject. I call this personal transparency.